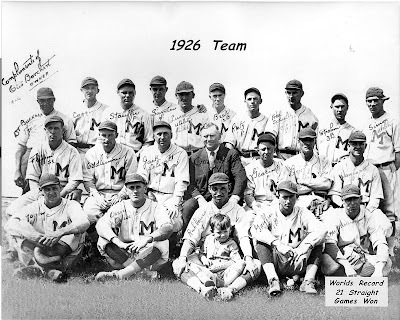 This is the 1926 squad, who under first-year manager Jack Lelivelt went on a tear during the early part of the season. The notation on the bottom - "Worlds Record 21 Straight Games Won" (May 25th to June 16th of that year), isn't quite correct. 21 wins in a row was an American Association record, but not a professional baseball record. The New York Giants won 26 straight games in 1916. The Brewers' streak would tie with the Chicago Cubs of both 1880 and 1935. The longest American League streak is 20 games, set by the 2002 Oakland Athletics. Buoyed by their streak, the Brewers finished the season 93-71. Their .567 mark was good for third place in the American Association behind Indianapolis (94-71) and first place Louisville (105-62). Lelivelt then guided the Brews to a second place finish in 1927, and third in 1928, befor being fired during the 1929 season. He moved on to the Los Angeles Angels of the Pacific Coast League, where he would have considerably more success, winning 137 games(!) in 1934. He left the Angels to scout for the Cubs in 1937 before returning to the PCL the following year to take the helm of the Seattle Rainiers, where he stayed until he died of a heart attack in January 1941. Sitting next to Lelivelt in the suit is team owner Otto Borchert. This would be his last team photo - he died the night before the 1927 season opener while speaking before 700 fans at a dinner honoring his team at the Milwaukee Elks Club. Also notable in the photograph (back row, far left) is the Brews' longtime trainer Doc Buckner, unjustly forgotten now but a legend in his time.